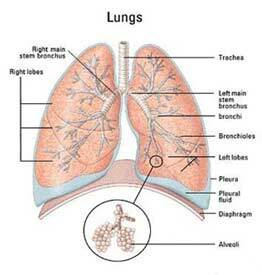 The above diagram of the lung shows the windpipe and the bronchus through which you breathe air into your lungs, and then into the very fine air sacs – the alveoli at the base of the lungs. The pleural cavity shown on the diagram allows space for the lungs to expand and contract as you breathe air into them. The pleura has fine membranes lining the chest wall and the lungs. Pleural plaques are localised, well-defined areas of pleural thickening – rather like calluses on other parts of the body. They are patches of tough sinewy tissue formed on the pleura on the chest wall. The pleura is a two-layered membrane surrounding the lungs, shown on the diagram. 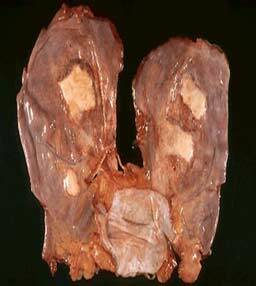 Sometimes these plaques are ‘calcified’ and may be referred to as ‘calcified pleural plaques’. These plaques can be seen on x-rays. Usually, pleural plaques don’t cause any symptoms of breathlessness or discomfort, so it is unlikely that you would know that you have them. 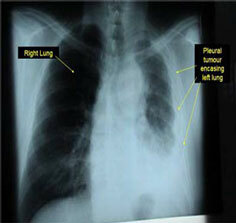 Pleural plaques are seen as the least serious form of asbestos disease and are not dangerous in themselves. However they are seen as an indicator of exposure to asbestos, and there is a small chance that one of the other types of asbestos disease could develop as a result. Diffuse pleural thickening is similar in appearance to pleural plaques, but the ‘thickening’ is more widespread and may involve both layers of the pleura. As with pleural plaques, one or both lungs may be affected. Diffuse pleural thickening can cause breathlessness – and because of this it is considered to be more serious than pleural plaques. This thickening or ‘fibrosis’ can be identified sometimes through clinical examination, but is usually diagnosed by x-ray. 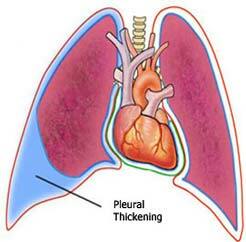 Sometimes a build-up of fluid in the pleural cavity occurs before diffuse pleural thickening develops. This condition is called a ‘pleural effusion’ and can cause breathlessness and – in some instances – pain. It can take 10-20 years to develop pleural plaques and pleural thickening after exposure to asbestos. Asbestosis is the most widely-known disease associated with asbestos exposure. 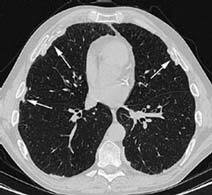 Many people think that asbestosis is a cancer, but this not the case. Asbestosis is also sometimes called ‘interstitial pulmonary fibrosis’. Put simply, this means that the lung itself is damaged by the body’s inflammatory reaction to asbestos fibres. The inflammation results in scar tissue – or fibrosis – building up in the interstitium (the tissue between the air sacs). The build-up of fibrosis reduces the elasticity of the lungs, and they become stiff – making it less easy for the lungs to inflate when breathing. 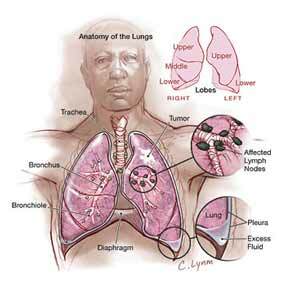 Symptoms of asbestosis include breathlessness (especially on exertion), a dry cough, and chest tightness. 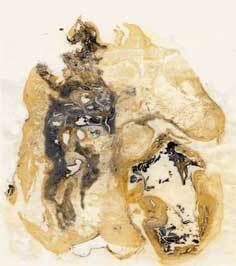 Asbestosis may progress even after exposure to asbestos has ceased, and it cannot be reversed. However, the extent of the progression varies widely, as does the effect on breathing. It can take up to 20 years for asbestosis to develop, but this time scale may vary either way. Workers exposed to asbestos have an increased risk of developing lung cancer. This risk is greatly increased if the person smokes. It is very difficult to distinguish lung cancer caused by asbestos and that caused by smoking or other environmental pollutants, so it is often very difficult to get a clear diagnosis of asbestos-related lung cancer. Mesothelioma used to be a relatively rare cancer. It is also known as ‘diffuse’ or ‘malignant’ mesothelioma. It can affect the pleura (the lining of the lungs), and less commonly, the peritoneum (the lining of the abdomen). It can also affect the pericardium (the area around the heart). It is a very aggressive cancer for which there is presently no known cure. This cancer can take up to 50 years to develop and is almost always associated with exposure to asbestos, in some cases only for a short time. Cigarette smoking does not cause mesothelioma. 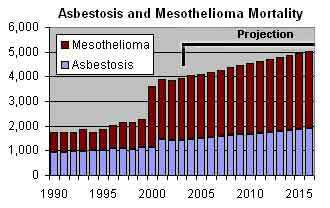 Unlike other asbestos-related diseases, mesothelioma is not ‘dose-related’. It is possible to develop mesothelioma as a result of relatively short periods of exposure to asbestos. People have died of mesothelioma as a result of living near to asbestos factories, or living with someone who worked with asbestos and brought asbestos dust home on their clothes. An early sign of mesothelioma is an effusion (a build-up of fluid) in the pleural space around the lung or the peritoneal space in the abdomen – this can cause pain and breathlessness. Sometimes it is very difficult to make a diagnosis of mesothelioma and more than one biopsy (a small tissue sample) is sometimes needed. Although there is currently no treatment for mesothelioma, research and clinical trials are taking place. There are helpful treatments that deal with the symptoms, such as removing fluid from the pleural space to relieve breathlessness. There is also a procedure known as ‘pleurodesis’, which may be carried out to prevent the fluid re-accumulating in the pleural cavity. Pain, which is often associated with this illness, can be controlled successfully. The Institute of Cancer Research has predicted that the number of people suffering from mesothelioma in the UK is likely to rise to around 3,000 per year in the next 20 years. The HSE say that there will be at least one asbestos-related cancer for each mesothelioma. This means that there could be up to 10,000 asbestos-related illnesses in the UK annually by 2020. In fact, these estimates are quite conservative – as some experts believe there are many more asbestos-related lung cancers than officially recognised. These figures make asbestos, the UK’s single biggest industrial killer!